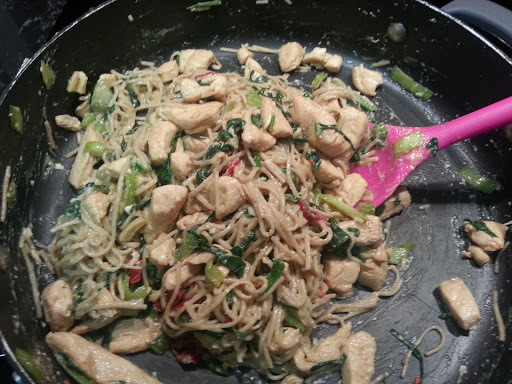 One of my favourite lunches to make for myself as a teenager was two minute chicken noodles with an egg stirred through in the hot pan. As weird as it sounds, I loved it so so so much. I wanted to create a (healthier) blast from the past for dinner one night this week, and this is what I came up with. 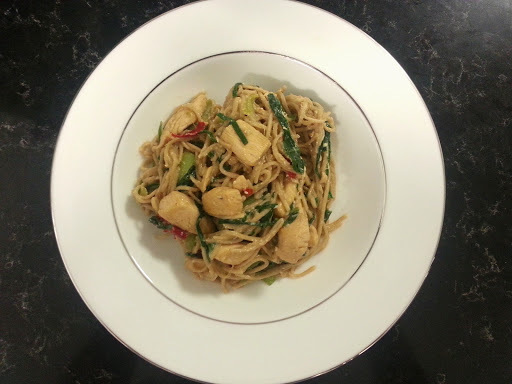 It made use of some bok choy, shallots and cayenne chilli which we have been growing in our balcony garden, which was even better. Cooking with food you have grown yourself feels so grounded and beautiful. This meal takes all of 10 minutes to make and serves 4. I loved it. The egg adds protein, holds everything together, and tastes great. Sub the veggies for anything else you like and have on hand. I wanted to use what was fresh in my garden, so chose those options. I’m quite partial to bok choy given that it has both a dark leafy green which wilts through the meal, and a crunchy base for texture, so I tend to use it in most stir fries. You probably have your own favourites. This meal could easily become a vegetarian delight by omitting the chicken and swapping the chicken stock for vegetable stock. Simple! 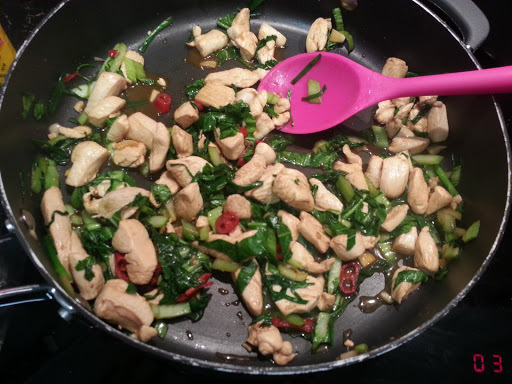 Seal chicken in a hot frypan or wok. 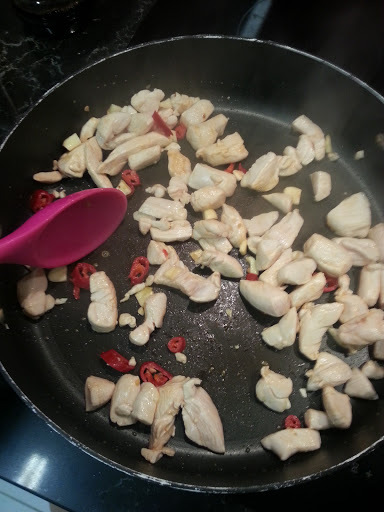 Once it is sealed, add chilli, garlic, ginger and ginger. Stir fry for a minute. Add the vegetables and continue to stir fry until the chicken is cooked through and the veggies are just how you like them. Meanwhile, bring a pan of water to the boil, adding chicken stock. Add the soba noodles, cook until soft (approx 3 minutes). Drain soba noodes, then add them to the wok. Crack the eggs over the noodles, stir to combine. It worked! It is a different texture to your normal stirfy and more filling. It was high in protein, took all of 10 minutes and I loved it. Noms. Full disclosure – it wasn’t the Dragon’s favourite meal ever, but I loved it. All the more for me!